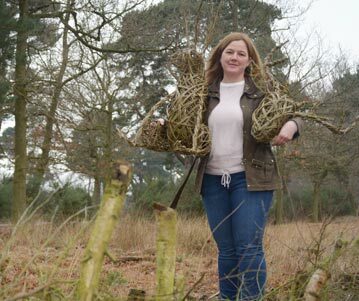 Twigs and Sprigs gives you the opportunity to learn new skills and create willow sculptures or floristry designs. It’s both fun and rewarding and I look forward to sharing my skills, passion and enthusiasm. Based in North Yorkshire I construct willow sculptures, floral designs and run workshops for all ages and abilities, using all things from nature. I have always been amazed at how clever willow sculptures are, to take a piece of willow and then manipulate it to create anything you want and give your structure such character and personality using different techniques. I first became interested in willow after seeing some fantastic sculptures at our annual summer trip to Egton Show. At the time, a busy mum and teacher I kept promising myself that I would give myself some ‘me’ time and have a go. In March 2013 I booked myself onto a willow workshop and made a willow pig which my children named it ‘Martha’ and who sits proudly on display at home. I came away from the workshop enthused and excited to make more. I have since made many more ‘Marthas’, reindeers, Christmas trees, wreaths, stags heads and hares to name but a few. I am enthusiastic and passionate about willow and wish to share my skills and knowledge with you which is both fun and rewarding. In 2016 I enrolled on a floristry course and enjoyed creating candle displays, hand-tied displays, garlands and wreaths. I have enjoyed combining my love of willow with floristry to create wreaths and offer both willow and floristry workshops. Please don’t hesitate to contact me if you are interested in any of my workshops, designs or have a specific request as I am always pleased to take on a new challenge!